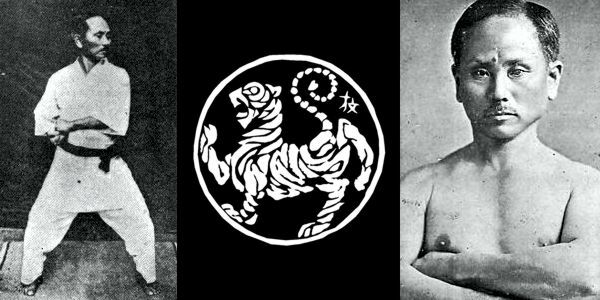 The term Shotokan was derived from Gichin Funakoshi’s first official dojo built in 1936 at Mejiro. The dojo was destroyed in 1945 by allied bombs. Funakoshi’s pen-name was Shoto or “pine-waves”, which is the movement of pine needles as they are blown by the wind. He used this name in his poetic and philosophical writings and messages to his students. The Japanese word kan means “house” or “hall”. 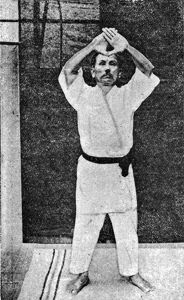 Gichin Funakoshi never gave his system a name, just calling it karate, but to honor Funakoshi, their sensei, his students created a sign reading shōtō-kan, which was hung above the entrance of the hall where Funakoshi taught. Shotokan training is usually divided into three parts: kihon or basics, kata which are forms or patterns of techniques, and kumite or sparring. Shotokan Techniques in kihon and kata are characterized by deep, long stances that provide stability, enable powerful movements, and strengthen the legs. Shotokan is often regarded as a ‘hard’ and ‘external’ martial art because it is taught that way to beginners and kyu rank or colored belts to develop strong basic techniques and stances. Initially strength and power are demonstrated instead of slower, more flowing motions. Those who progress to brown and black belt level develop a much more fluid style that incorporates grappling and some aikido-like techniques, which can be found in the black belt katas. Kumite techniques mirror these stances and movements at a basic level, but are less structured, with a focus instead on speed and efficiency. Gichin Funakoshi was a philosopher and believe that martial arts was a way of life and not just self defense. He laid out the Twenty Precepts of Karate, or Niju kun which form the foundations of the art. Within these twenty principles, based heavily on Bushido and Zen, lies the philosophy of Shotokan. The principles allude to notions of humility, respect, compassion, patience, and both an inward and outward calmness. It was Funakoshi’s belief that through karate practice and observation of these 20 principles, the karateka would improve their person. The Dojo kun is usually posted on a wall in the dojo, and some shotokan clubs recite the Dojo kun at the beginning and/or end of each class to provide motivation and a context for further training.